The Finovate Conferences showcase the top new innovations in fintech. 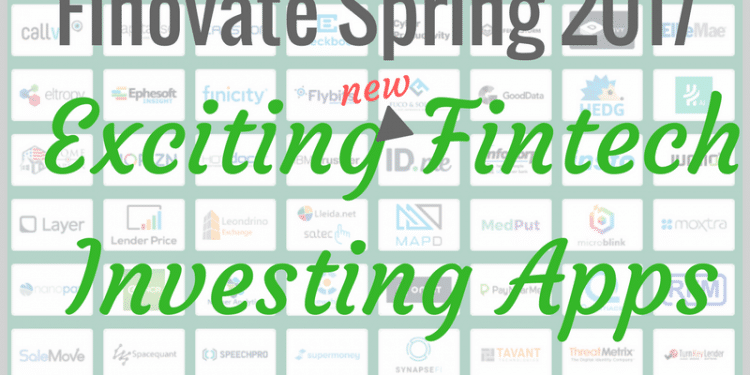 Among the banking, insurance, security and more are several exciting new investing related platforms. From Capitali.se for active traders to NewChip for Angel investors on a dime, there are exciting apps and ingenious platforms to facilitate investing. Fintech is getting creative, more affordable with options for the millennial to the quant. 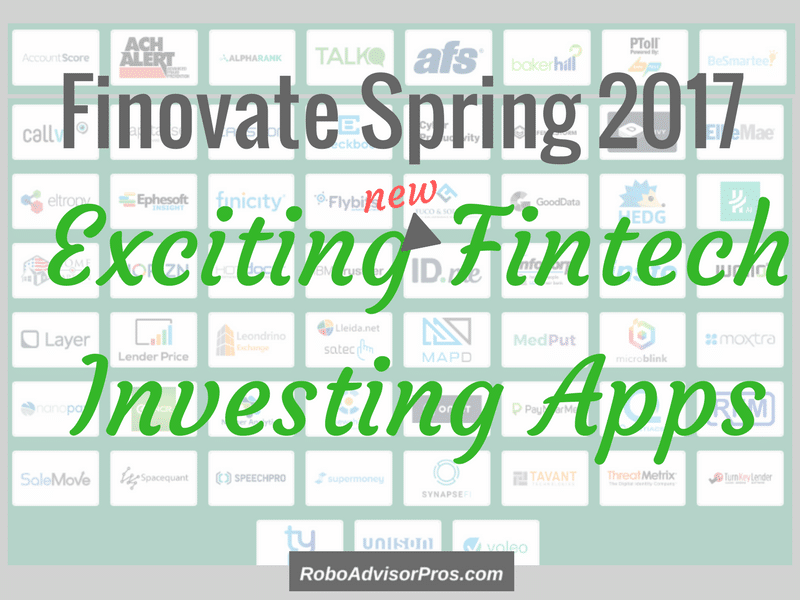 Following are the newest investing-related fintech platforms showcased at this year’s Finovate 2017 event. If you’re looking for the newest ways to invest, or if you’re an angel investor, seeking a new project, check out these cutting-edge companies. Hedge is another investment customization play for the millennial and Gen X user. HEDG is a robo-advisor+. The HEDG investment platform lets you build your own investment fund. Similar to a typical robo-advisor or investment plan, you’ll start out with a general asset allocation. Most robo-advisors allow you to tweak your asset allocation within specific parameters. HEDG permits you to add or subtract any number of holdings from your initial asset allocation. If you’re anti-gambling and anti-smoking, then you can delete vice holdings from your portfolio. Maybe you’re a Warren Buffett devotee and want to include some of the investing icons stocks in your plan, you can do so. Ultimately, you end up with your own personalized investment fund. Wait, there’s more to the HEDG mobile or desktop app. You can connect with friends to trade tips or share your portfolio. HEDG creates a personalized newsfeed related to your positions along with financial tips and information. Ultimately, you can connect with an advisor if needed, for further assistance. The platform is in beta and you can sign up for the HEDG list now. Investment Clubs are moving into the digital age with Voleo. You typically don’t hear investing and fun in the same sentence. Yet, Voleo is a social way to invest with friends, pool their knowledge and resources, and ultimately make money. Set up your investment club. Name the club, set up voting parameters such as majority and time allowed to vote, and invite friends. Every member inputs their personal information into the Voleo (brokerage) account and the platform handles the rest. Once the setup is complete, the investing fun begins. Any member can suggest a trade. Next, the club members discuss the trade. Once the discussion is complete, the members vote and depending upon the outcome the trade is or isn’t made. If you’re loving the investing fun, then you can set up more than one investment team. For the competitive folks, each individual is scored on successes and failures. The fee to join and set up is free. The $12 trading commission is split among the members. Your club can hold from three to 100 members. Finally, the initial per person investment minimum is $500. Ultimately, you can research and study stocks on the platform, discuss and receive related news and information. Dreaming of becoming an angel investor, but short on cash? NewChip might be for you. This startup is out to democratize startup investing. Using an equity crowdfunding approach, you can invest in startups according to your interest, values and beliefs. Want to scour the world for new investment deals? NewChip is a good place to start. If you’re worried about losing your entire fortune to a startup that goes belly up, you can diversify by investing small amounts of money across a wide range of startups. Even if one fails, you’re likely to profit from another company’s successes. Legion M, the world’s first fan-owned media company. NORX raised over a half a million dollars for its mobile app that offers a free same-day prescription delivery service. Swiftmile, a solar powered electric bike sharing system for corporate commuters has such a popular idea, the firm has raised more than twice as much money than it initially requested. The app is easy to use. You can import personal and social preferences into your account. Swipe to invest. Rafols compares NewChip to Tinder for startup investing. There’s even a social aspect to the app. Your deal cards list your interests and you can share what you’re investing in and read about others forays into the equity crowdfunding arena. Divy is on a mission to make stock investing affordable, easy and accessible for all. Divy combines education, information, investing and fun in one app. Open a brokerage account, fund it and make your first investment in five minutes. You can buy any security for as small an amount as $10. Your commission could be as low as $0.10 or even zero. You can buy and sell from the app and use the proceeds immediately. It’s easy to rebalance your investments, within the app. Founder, Disney alum Marc Teren compared investing with Divy to browsing in a mall. Imagine that you saw the Matthew McConaughey Lincoln commercial and want to invest in the car, but have no idea where to begin. The 30,000 data notes will guide you to Lincoln and then to the parent company, Ford Motor Company (NYSE:F). As you browse, you compare Ford with other car manufacturers and gain immediate insights and information that educate you about the auto industry. Ultimately, you end up investing in a competitor, Tesla (NASDAQ:TSLA). Next, you move onto another passion, solar power, to explore investment options related to this interest. All along the way, you’re learning about finance, investing and the solar industry. When you decide to invest in First Solar, Inc. (NASDAQ:FSLR) you can invest your $10 immediately, for a small commission or you can place the order to execute at the end of the day, commission-free. The artificial intelligence of the Divy app works to introduce you to the companies that fund the products and services in the industries that matter to you. Don’t worry if you don’t know much about investing. The app seamlessly provides ongoing data and educational information. Although still in beta, you can request an invite to try Divy. The hard launch is coming this Spring. Capitali.se calls itself a virtual investment assistant for investors who implement active trading strategies. When I first read the program, I mistakenly thought that you had to be a computer programmer or brilliant quant to use this platform. But, it is so user-friendly that investors, with active trading strategies, can turn those ideas into computer algorithms. The computer program then turns these verbal instructions into an actionable computerized algorithm. Although you might think your strategy is brilliant and destined for success, you have an option to “Optimize Strategy”. That means you can select this choice and the program will improve on your initial strategy to make it potentially more profitable. If you don’t have any strategies yourself there’s a “Discover” option where you can choose a sector and next a strategy to implement. For the B2B market, financial advisors can use the platform to create their own branded robo-advisor. Quantiacs allows you to become a hedge fund trader and manager, without all of the messy paperwork. The company is on a mission to democratize quantitative finance. In fact, without investing a dime of your own money, you can earn 10% of the profits generated from your successful trading programs. Quantiacs explains how to write a trading algorithm. The company gives users a free open source toolbox along with 25 years of historical market data for 44 Futures and the S&P 500 stocks. You can use the data to backtest your trading hypothesis. Once you have a good trading algorithm, upload it to the Quantiacs system and the platform simulates your trading algorithm with live data. Ultimately, your trading program becomes available to institutional investors, and you have the opportunity to profit. If you’re a quant, interested in starting your own hedge fund business, without the hassle, this might be the path for you. Finally, there’s an added bonus – the Quantiacs algorithmic trading competitions offer prizes from $500,00 up to $1,000,000. There are enough robo and fintech investing solutions evolving to make your head spin. Check out the newest Finovate entrants into this exciting field and decide if any of them are your way to increase wealth.